Margaret and I will be offline for twenty-four hours or so, taking a day away from our reunited family to celebrate New Year’s and to catch Paula Poundstone (annoying background music alert) at the Paramount in Aurora. If you’re coming by to leave a comment, please be patient, ’cause I won’ get to them till tomorrow. In the meantime, permit me to commend to you Ethan Zuckerman’s ten-question quiz about African news of the past year (I saw it first at David Weinberger’s). I did well enough to not be mortified, but not well enough to boast; how about you? Yesterday morning, Margaret pointed me to the comments in David Weinberger’s post about Daniel Dennett. I had read the post and skipped the comments, because I heard David to be making a point to which I generally assented, with reference to a gesture — the “all religious people are deluded” gesture — about which I usually keep silent. When I turned to the comments and saw a vigorous back-and-forth involving Dave and Frank and Tripp, I was moved to speak up. I usually keep silent for various reasons. Most important, I try not to enter discussions where one loud participant already knows, beyond the shadow of a doubt, that anyone who disagrees with them is an idiot. I find that such discussions usually take up a great deal of time and care on my part, with no apparent benefit to either participant (except, perhaps, a mild inflation of my interlocutor’s estimate of their own intelligence — but that was already sufficiently high, in most cases). Plus, these conversations guarantee that one more person in the world thinks I’m an idiot, which outcome I prefer to avoid. I also avoid these discussions because I have friends who tend to endorse the anti-religious side of them, and this topic brings their outlook into a less pleasant light. If people whom I otherwise like (and who seem to like me) want to persist in a way of thinking that categorizes me as a fool, an oppressor, a judgmental ideologue, a deceiver, I’d rather not take part in a discussion that triggers their inclination to dismiss me that way. (There might be some discursive value to challenging them to think of the guy they know and whom they profess to respect as the deluded ogre their rhetoric would imply, but for all I know they like deluded ogres, or they don’t mind the dissonance.) Someone who would write off all “religious” people as fools only reveals their own superficiality, and I would rather not put my friends in a position that invites them to affirm their enthusiastic triviality in this matter. I venture to say that “someone who would write off all ‘religious’ people as fools only reveals their own superficiality” not because I believe that the soundness of religious belief is self-evident (far from it! ), but because I observe that some extraordinarily intelligent people find it possible to manage their lives with no trace of religious faith, and other extraordinarily intelligent people profess (and exemplify) very deep faith. “Religiousness” has never shown itself a useful predictor of folly, so far as I’ve been able to tell (nor has irreligion proved a sign of intelligence). Moreover, I don’t see useful distinctions between “spirituality” and “religion” or between “organized (or ‘institutional’) religion” and more fluid manifestations of faith, at least not as symptoms of more commendable intellectual standing. My ideological inclination probably colors my sense that Roman Catholics or highly-observant Jews are not stupider than more free-church-y, or “spiritual-not-religious” people, but though I be predisposed to favor such an assessment, I don’t think it’s groundless. I may be wrong — there may be a graduated scale of intelligence on which adherents of “organized” religions are lower, while adherents of religious practices with less explicit structure and dogma are higher. If that’s the case, I’m too low on the scale to be able to tell. Within my limited capacities and experience, a theory of intellectual rigor proves its worth by how it deals with apparent contradictions. When someone’s theory of irreligion confronts someone who appears to be quite brilliant, but who goes to St. Nicholas Orthodox Church, by saying that such a person must be foolish, I tend to doubt the theory (rather than dismiss the apparent wisdom of the subject). When an explicitly irreligious person shows painstaking attention to the nuances of theological affirmations, taking seriously the patterns of difference and convergence to which David Weinberger’s original post pointed, I regard that person’s observations quite highly; their religious skepticism doesn’t oblige me to disregard or deride them. Who’d have thought it? Downloadable audio — podcasting — helps church attendance. We’e wondering if Doc Searls makes house calls. We know several recording engineers, but no one who knows more about the transmission end of the radio business; every month or so, Doc offers a seminar in some aspect of FM radio: band distribution, the effect of ground conditions, how to make your iPod transmitter work better, whatever. We need Doc because we get bad reception on our household FM radios, even though we live well within the full signal strength of WBEZ (our local NPR affiliate). The radios downstairs manage all right, but the clock radio in the master bedroom sometimes doesn’t register a signal at all, sometimes picks up two stations, and receives a fine, clear signal. Sometimes it helps if I’m holding the clock radio; sometimes it makes a difference if I jiggle the cord; most of the time, the reception stays mediocre. My sister gave me a fancy, improved clock radio for Christmas, and I was hoping that the problem had been limited to the dime-store clock radio we had been using. The new radio comes with an FM antenna (well, a wire that the packaging calls an FM antenna), so we figured it was bound to zero right in on WBEZ, and we could listen to our hearts’ content. I’ve done some para-typographic work in my day, and have remained over-attentive to matters of type and page design. Thus I choke up with type-design exhilaration at the Typographi.ca Year’s Best Type column. Some of these faces impress the daylights out of me. It would be great, for instance, if Seabury could change from Trajan to the finer, subtler Garda. As Stephen Coles says in the introductory paragraph, “As public awareness of typography increases, it becomes even more important to use something other than the same old stuff that lingers in your font menu.” There’s no reason a school or a congregation can’t decide on a serif text face, a complementary sans-serif for headings and captions, and a display face for headlines (not that one might not ever deviate from them, but as a house rule for institutional printing). If expense is a concern, why not adopt Lido STF as a visibly distinct alternative to Times Roman? The Ascender Creativity Font Pack will cost only $20, but includes several very fine typefaces that distinguish one’s organization from every other place in the world that just uses the default typefaces that come with their system software. Better yet, hit a benefactor for a specific package. Today’s the day we celebrate Christmas at our house (it’s within the twelve days of the season, so this is kosher, although I hope no one gives anybody three French hens). Nate had some singing jobs lined up and couldn’t get away; Jennifer still won’t arrive till Saturday, but there’s only so long you can put things off. 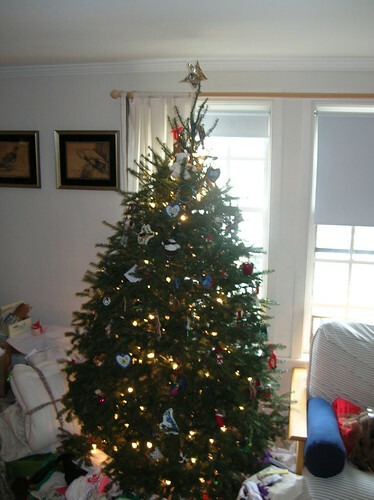 Close examination of the giftage around the tree will reveal something (typically) odd. It turns out that Pippa Margaret decided that we ought not participate in the annual deforestation ritual that requires every gift to be surrounded by paper destined to the torn off and discarded in a matter of moments. 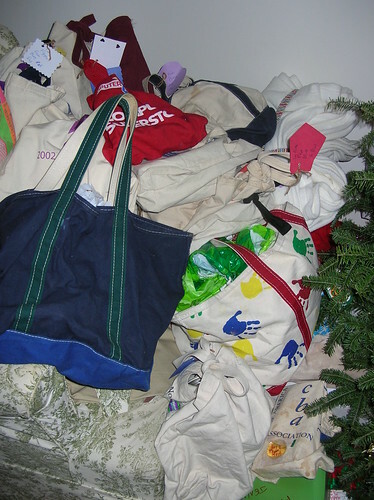 She brilliantly connected the problem of gift-concealment with the query I posted last summer concerning what to do with canvas tote bags. As a result, the gifts from local family members to one another have all been wrapped packaged in canvas totes, tied closed with a tag that Pippa prepared. Yet another stroke of out-of-the-box thinking from your syncopated blogging friends here. It’s been a tough year for natural disasters. A year ago, hundreds of thousands of people died in the devastating tsunami in South Asia. An October earthquake killed tens of thousands and destroyed the homes of millions more in Kashmir. Hurricane Stan killed thousands in Central America, and in the U.S. Hurricane Katrina killed thousands, despoiled a beloved major city, and wiped out the structures of entire coastal areas. We haven’t forgotten any of these, but this morning I spent extra time trying to wrangle copies of students’ notes for the classes David Knight took back when he was in seminary here. I followed links he sent earlier this week to an editorial stock-taking and some visual reminders of how Katrina affected a far greater swath of the Gulf Coast than only New Orleans. If your Christmas can include yet another round of sharing what you have with others who have lost much, you’ll be the richer for it. If the media incline to the left, why has all the coverage of the transit strike in New York (all that I’ve heard, in other words “mostly NPR and online news sources”) stressed the hardship this strike imposes on commuters, tourists, hoteliers, and merchants, and the unusually-comprehensive pension and health care package that the laborers are striking to maintain? A lefty press would, I’d imagine, lionize the brave workers who have drawn the line at corporate exploitation (billions of dollars of profits, comfy benefits at the top, but a desperate need to cut benefits for the laborers who actually make the transit system run). A left-inclined press might be baying at the heels of congressmen and White House officials who have fallen afoul a special prosecutor for violations of political procedure rather than for lying about a stupid, tawdry sexual affair. A left-inclined press might try to suppress or rebut, rather than perpetuate and amplify, reports that the press inclines toward the left. Or so I’d think. This morning brings yet another complaint about the internet as the ostensible cause of stupidity, inn the name of a greater civility that apparently arises automatically when people communicate face to face. Evidently the author, who admits to having gone to college “way back in the technological stone age (the mid 1990s),” lacks sufficient experience of face-to-face interaction to back up his overripe nostalgia, but he might have stopped to drink a cup of badly-perked academic coffee and thought back on centuries of life in educational institutions before he committed such callow folly to public display. News flash: The academy has never been the idyllic preserve of systematically undistorted communication after which Steele hankers; academic life involves a perpetual negotiation of generosity and venality, liberality (in its best sense) and reaction, the search for truth and the struggle to control how that search turns out. Very often, academic people behave extremely badly. It didn’t start with the Internet, face to face interaction doesn’t solve the problem, and a great many more academic conflicts and misdemeanors take pace through good ol’ fashioned scheming, manipulation, personal interaction, and offical memo than through web sites. But while the subject of Paul Mirecki has come to the surface (Steele refers to Mirecki’s situation as one of his examples), has anyone ever made a less-appealing case for himself? He might have simply, patiently offered a course on Intelligent Design, displayed its characteristics and encouraged students to think through the problems involved in construing it as a scientific theory, while at the same time encouraging students to push as hard as they care to against the mythos of evolution, and everyone involved could have learned a lot. Instead, he revealed a streak of intolerance that should embarrass him, then claimed that KU’s squeezing him out of being department chair constituted a breach of academic freedom. Oh, the pernicious effects of the internet. . . .
Kevin has a neat post about the difference between digital reproduction and physical theft. The overdeveloped world can persistently legislate technological and judicial sanctions to enforce the illusion that the conditions of [re]production have not changed — but since letting digital media function as they do best costs less in hardware, software, and just plain bother, there will always be places in the world (hence, always a place online) where copying will remain free. In this context, I’m tickled to point to Michael Iafrate’s holiday album, Happy Xmas, X is Here , with downloadable mp3s.